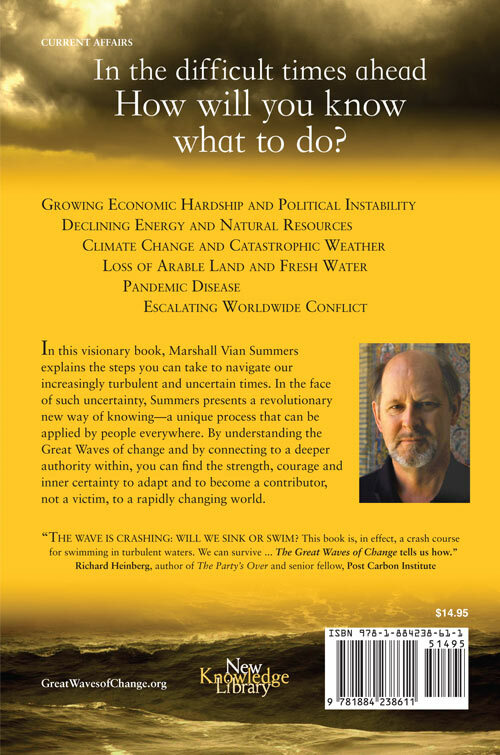 Great Waves of Change - In The Great Waves of Change, Marshall Vian Summers explains the steps you can take to navigate our increasingly turbulent and uncertain times. In the face of such uncertainty, Summers presents a revolutionary new way of knowing a unique process that can be applied by people everywhere. By understanding the Great Waves and by connecting to a deeper authority within, you can find the strength, courage and inner certainty to adapt and to become a contributor, not a victim, to a rapidly changing world. We have no choice anymore, this is where our world is going and we need to be strong and united. It's not for me to explain, it's for you to read. Be warned, it will challenge your whole beliefs about yourself and our world. Our future is not rosy and we have to unite together and learn to be strong. Tips to help you prepare for what is coming and it's in our lifetime not a 100 years away, not even 50 years away, it's on it's way and we cannot stop it totally, but we can all come together to help each other ride the storm. We must enhance our self-sufficiency. This book is a wake up call for us to preserve our environment. If the human race isn't going to preserve the environment out of moral concern, then it must do it as a necessity to prevent societal collapse and promote self-sufficiency. This book shows what each individual can do to make a positive impact for future generations.